Admire your glorious Layered Mango Dessert when it comes out of the fridge! This mango dessert looks magnificent, tastes wonderful and is easy to make. Stir boiling water into dry gelatin mix in large bowl 2 min. until completely dissolved. Add nectar; mix well. Pour evenly into 3 small bowls. Refrigerate 30 min. or until slightly thickened. Add 1 cup of the mangos to 1 bowl of gelatin; stir. Pour into 10-cup mold sprayed with cooking spray. Refrigerate 30 min. or until set but not firm (gelatin should stick to finger when touched). Meanwhile, pour contents of second bowl of gelatin into blender container. Add remaining mangos; cover. Blend until mangos are pureed and mixture is well blended. Pour over gelatin layer in mold. Refrigerate 20 min. or until gelatin is set but not firm (gelatin should stick to finger when touched). Stir sour cream into remaining bowl of gelatin until well blended. Carefully spoon over mango gelatin layer. Refrigerate 2 hours or until firm. Prepare as directed, using 2 pkg. 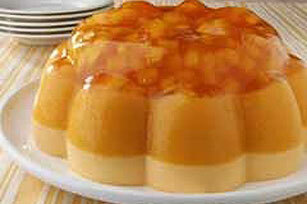 (8-serving size each) JELL-O Orange Flavor Gelatin. Unmold onto bed of salad greens. Garnish with edible flowers.